Two-way radios are key to communication and survival during an emergency, but are your radios ready for use when the time comes? There are 7 questions you can ask yourself to find out if your emergency radios are ready to perform. Even when phones let you down a two-way radio will continue to operate with efficiency. The number one time cell phones tend to go out of service is during an emergency because so many people are trying to access the same line at the same time. Also, certain types of emergencies such as a storm or other natural disaster may cause phone lines to go down all together. Even if an entire town is in shambles a two-way radio will continue to operate for effective communication. If you use two-way radios on a regular basis you are more likely familiar with how to ensure radios are ready when needed. On the other hand, if you only plan to use radios during an emergency there are things you need to be aware of so that your radios actually work when the time comes to use them. Here are 7 questions to ask yourself to know if your emergency two-way radios are prepared for use. 1. Do You Know How To Use The Radio? This might seem self-explanatory and a no-brainer but you might be surprised how many people have two-way radios for emergencies but don’t take the time to really learn how to use them. Keeping your radios stored away with the non-perishable food you plan to eat during an emergency is not recommended. 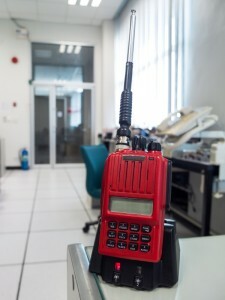 Not only do radios need to be charged, but they also need a knowledgeable operator. It’s not hard to use a two-way radio, but a little practice to test out your skills will help ensure you know just what to do. 2. Have You Tested Your Radios In The Location You Plan To Use? Always test out radios for emergencies in your immediate location to ensure nothing interferes with signal. If you wait until the last moment to check reception you may end up with a non-responsive device, which could have been identified and solved prior to an emergency. 3. Do You Have The Appropriate License? There are certain walkie-talkies you can buy just about anywhere that operate over shared lines of communication and do not require a license. In an emergency these lines could be harder to access, as many amateur radio users will be using them. This is still beneficial because you can tune in and see what is going on, but it might not grant you the chance to communicate outward. General Mobile Radio Service will cost you $85 every five-years and provides access to communication lines with less possibility of interference. 4. Do You Test Emergency Two-Way Radios Frequently? It is recommended that you test two-way radios at least once a month to ensure they are properly working. If a problem arises with a particular device you don’t want to wait until an emergency arrives to find out. 5. Do You Also Have An AM/FM Radio? Having a basic AM/FM radio is a great tool in any emergency. Local news is the most important news during an emergency. Knowing what is going on in your local area offers peace of mind, direction and helps formulate a game plan of action. Make sure to store plenty of spare batteries so that your AM/FM radio is guaranteed to work. 6. Do You Have A Plan Of Action That Everyone Knows? A home or business emergency plan of action needs to be clear and very well known between everyone involved. Post your emergency plan on a wall somewhere convenient for people to locate and see on a regular basis. Every so often go over the plan with everyone to keep people in the loop about what to do in an emergency. It’s always helpful to have some back up plans too. Oh, and make sure everyone knows how to operate a two-way radio. 7. Have You Joined Your Local Radio Community? There are so many benefits to a two-way radio during an emergency. Many instances throughout recent history have caused cell phone communication to dwindle or disappear all together. For instance, snowstorms in 2007 that ravaged all the way from Kansas to Georgia caused power grids to go out for days. As a result both cell phones and even computers become unusable for communication. Two-way radios are often the only form of communication available during an emergency. No one wants to be isolated or in the dark during an emergency. Communication can be the difference between life and death. For the latest emergency two-way radios contact Highland Wireless today!